Yes, it’s still high summer, but there are little signs everywhere that show autumn lurking. Not too fast, we clamour…but it will arrive in it’s own sweet time, nonetheless. Enjoy every last moment of this awesome season! For more Haiku my Heart, visit the lovely Rebecca @ http://www.corazon.typepad.com/. ~ by Dawn Elliott on August 19, 2011. 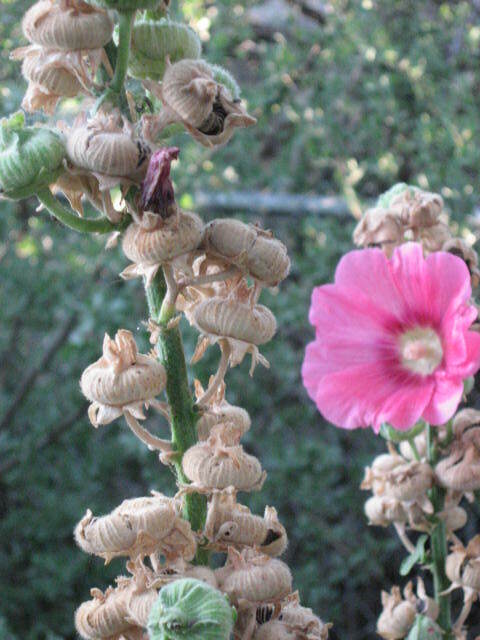 I love hollyhocks and look at all those seeds! Summer has been miserable here … way too hot. So, I am looking forward to Autumn … sometime in November!!!!!!!!!!! yes, signs of autumn here…cool mornings and evenings sandwiched in between hot hot days. this honoring of all that is to come. i hope you will have a chance to visit today…the invitation is out for dia de bloglandia!!! stephanie and i look forward to a soul stirring time, won’t you join us?